Ynet reports that two more Qassam rockets, indiscriminately fired yet again by the terrorists of the Hamas-controlled Gaza Strip into the general direction of Israeli population centers, exploded in the Shaar Hanegev region. One struck a warehouse near a kindergarten. AP says the warehouse was destroyed and fortunately the kindergarten was unoccupied. A second rocket exploded in an open area shortly after. Thankfully, there are no reports of injuries - but the terrorists planned a different outcome and must be disappointed... and will surely keep trying until they are stopped permanently. Dudi, a father whose son attends the kindergarten, estimated there were only seven seconds between the alarm and the explosion. "The rocket hit the outer wall," he recounted. "It's very frightening for a father who has a child in kindergarten, despite the fact that they are fortified. Some two hours before the hit the kids left the kindergarten, and some of them play in an adjacent playground. If, God forbid, the rocket would have landed then there would have been chaos. " 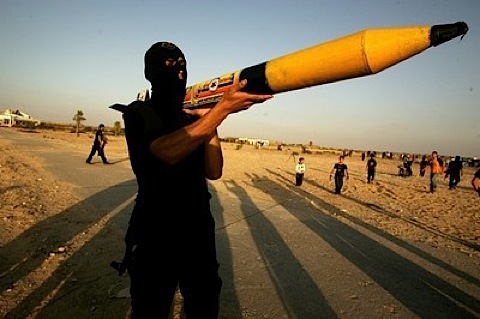 As it turned out, a few teenagers were playing outside when the rocket landed. They ran for cover in a nearby fortified area and were miraculously spared injury. The Chief of Staff of the IDF, Lt-General Benny Gantz warned the Knesset's Defense and Foreign Affairs Committee today behind closed doors that an Israel mission to stop the men with the rockets is needed. He is quoted saying what large swathes of the Israeli citizenry have said for years: "We cannot tolerate repeated cycles of violence in Gaza." The Haaretz report of his closed-door comments quotes his view that "recent rounds of escalated violence and the injury of both lives and the daily routine of citizens of Israel's south are leading to a reality in which the IDF will have to take significant, aggressive action in the Gaza Strip." How can the leaders of Israel, sleep soundly in their expensive comfy beds miles away, knowing that Jewish children may be murdered at any moment?? How lucky no one was hurt. As you say this is foolishness and it will soon lead to death!! I am totally sickened that they can permit this without batting an eyelid! !